Put 250g couscous and ½ tsp salt in a large bowl. Stir in 300ml boiling water, then cover with clingfilm for 10 minutes, until the grains are plump and tender. Chop 3 pitted Medjool dates and cut 45g dried apricots into slivers. Roughly chop 45g shelled pistachios and place in a pan with the dried fruit, 10g butter, 1 tsp cinnamon and 1 tbsp olive oil. Stir over a medium heat for 1 minute until the butter has melted and the fruit has warmed through. 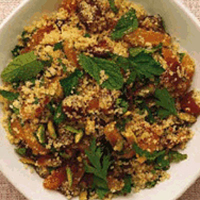 With a fork, work the fruit and nuts into the couscous, breaking up any lumps as you go. Stir in 2 tbsp each chopped flat-leaf parsley and chopped mint.